After three years of trying to get the National Department of Public Works to release land so that a new community health centre to serve the Du Noon area and surrounds could be build, the province has finally got the green light from the new Minister. The release of the land to province by Public Works comes a month after Western Cape Health MEC Theuns Botha got so frustrated that he announced his department had given up on trying to get the land situated near the Killarney racetrack and were looking to build the 24-hour health facility elsewhere. But yesterday Botha said just when his department was about to purchase private land at a “significant cost”, MEC for Transport and Public Works Robin Carlisle eventually succeeded to get the land they needed from the national department. “Our (Western Cape Provincial) government interacted for the past three years with three ministers of Public Works, I interacted with the national minister of Health, and the Premier interacted with the President. It has been a terribly frustrating exercise and one would hope that the national Public Works will become more efficient under its current leadership,” said Botha. 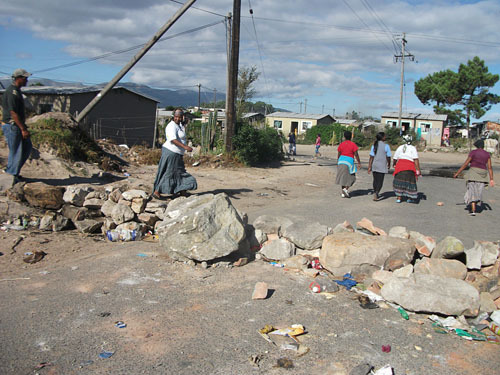 On Monday Carlisle announced that Public Works Minister Thulas Nxesi, who was appointed in October last year, signed over the land needed in order to build new premises for the Umyezo Wama Apile Combined school in Grabouw which was the cause of violent protests over overcrowding at the school in March this year, and for the Du Noon Community Health Centre.